Infrared-thermography is an emergent technique for non-destructive testing in Civil Engineering. This method directly senses the infrared radiation, that the investigated structure emits, and is consequently able to detect the differences of temperature on the surface. Detection of subsurface defects by means of IR-Thermography is possible, since empty spaces modify the heat flow trough the system, generating surface temperature dissimilarities. This kind of approach must be associated with another assessment technique to obtain reliable results. The characterisation trough thermal impedance is a way to obtain information by means of non-destructive testing. This methodology and processing make it possible to display prominent subsurface defects. In the field of the non destructive testing of buildings, the thermal methods are emergent. In non-destructive testing of buildings, thermals methods emerge. In addition to NDT, several other NDE methods are available, among them the so-called big five: radar, acoustics, electric, electromagnetic and x-ray radiography. The methods are standardized in North America. The datas are crossed to ensure a best precision in results. 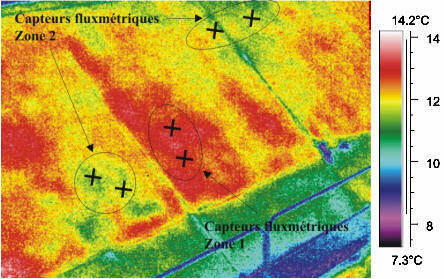 The recent appearance of infra-red thermography allowed the thermal methods to involve in the inspection of buildings. It is very gravitational from its use facility (standard video camera), it is carried out without contact and profits of a presentation from the results in the form of thermal picture. Behind this simplicity apparent, an interpretation of results requires much experiment and knowledge from the parameters influencing of the measurement . The thermal impedance  has been used for several years in our laboratory to characterize materials and their evolution . From the experimental point of view, it's a method based on a use of fluxmetric sensors , robust, reliable and light, adapted to an in situ use. A processing data of flow and temperature is necessary to reach the required parameters. The combination of both methods is arouses double interest. The first lies in the fact that we use two thermal methods based on different transfers. A thermal impedance, where the sensor is in contact with the system, is based on a study of the transfers by conduction. The infra-red thermography, which is a remote measurement, associating the radiative transfers. The second interest is from the point of view of the results. Thermography brings qualitative datas, which are complementary with impedance study, which under certain conditions, allows to treat a quantitative aspect of the problem. At the moment, thermography is used to valid the observed results of remote measurement. Infra-red thermography is a technique of non-destructive testing which provides a thermal image of a scene observed. With the proviso of well controlling various parameters, which intervene in the radiative exchanges between surface and the camera, it is possible to have a cartography of the field of apparent temperature of surface. The temperature's gradients observed on the surface of a concrete building can highlight anomalies in material. The available information is qualitative. The characterization by thermal impedance is a mean of obtaining quantitative elements in a non-destructive way. This is a tool allowing the thermal characterization of the systems with simultaneous measurement of the evolutions of density flux and temperature in the same plane . The behavior of the system is then apprehended in the frequential field. The studied site relates to the banks of a canal, on the level of a lock. Those were reinforced by a concrete facing cast in place, to allow the dock and pleasure boats and to slow down the degradation of the slope. The observed zone extends on a hundred meters and the height of the bank varies from 3,50 m to approximately 1 m. The angle of slope is about of 45°. It's made up of a sheeting piled wall ensuring sealing of the canal, the dock, the embankment (ground), the protection of lock being ensured by reinforced concrete facings. Those consist of concrete slabs of 3 m by 3,50 m for the greatest heights, the thickness being of about 10 cm. The degradation of the ground support in under-face of the slabs results from of rainwater infiltration at the head of slope (footpath). Water circulation reveals specific undermining until sheeting piled wall level. From a certain degradation level, the stability of slabs is called into question. From current state of concrete facings, the objective is evaluating the position of the cavities behind the facings by crossing the thermal results of both methods. The first one, global, from the remote observation by infra-red thermography allows the localization of the suspect zones, the second one, local on surface, confirms the result anticipated by thermal impedance of it. Both techniques are based on analysis heat exchange between a system and its microclimatic environment. The studied process there, relates to thermal front propagation with conduction in a system where the presence of anomaly affects diffusion. One finds in our configuration two cases. First is represented by a healthy medium where the concrete is in contact with the slope. By the thermophysical properties of materials, we can regard this medium as continuous and capacitive. With its thickness, the assumption of semi-infinity is assured. We are thus in the case of thermal shaft where the variations of temperatures of surface will be conditioned by the conductive medium. The second case, is represented by a deteriorated medium where discontinuities appear. Actually, they appear as pockets of air, therefore thermal resistances inserted between the facing of concrete and the slope. Their presence will influence more the temperature of facing surface which will be more sensitive of environment microclimatic excitations. On the principle of the presence or not of discontinuities in the system, we can pass to global approach of surface control by infra-red thermography. Infra-red thermography works on the principle of transmission of heat by electromagnetic radiation. The body transforms part of its calorific energy by emitting an thermal radiation. If we consider our system, from the excitations which are naturally imposed to him, it transfers on surface in all the directions of space an energy into the form of a electromagnetic radiation. It is this radiation which we will collect thanks to the camera. We thus observe an excited system thermically with an aim to obtain a cartography of the apparent surface temperatures. The measurement results comes from the emitted radiation of the system, the reflected radiation by environment and the radiation of atmosphere. Figure 1 schematizes the observation's principle of the system. From the imposed natural excitations, the system answers according to its configuration. By our experiments, we know that the privileged moments for thermographic inspection are at the end of the day, when the medium leaves a significant energy period of storage, that is to say early the morning when the medium restores its energy with its environment. It's necessary to privilege measurements in covered weather to neglected direct solar radiation and to know that measurements in rainy weather are ineffective because of homogenization of the surface temperatures. In our study's case, it was necessary to make certain assumptions to measurements on surface, to homogeneity of facings and to uniformity of the surface temperature. By considering the distance separating the concrete facings from the point of measurement like its surface compared to emitted solar flow, these assumptions are completely admissible. Certain constraints of measurement were imposed: a minimum of excitation is necessary to excite the system, measurements must be carried out in covered weather to avoid the reflection of the direct solar radiation, and with the configuration of the ground, the erection had to be made on the opposite bank with limited number of stations. The aim of measurements is to obtain a thermogram of all plates to locate the defects in under-face of the concrete facings. From cartography of surface temperatures obtained by infra-red thermography, the purpose of the method by thermal impedance is to validate the detection of the supposed defects. Indeed, with put forth assumptions, we know that the variation of temperature observed on the surface can be due to variations of emissivity, non-uniform excitation, variable water contents or even to heterogeneities of ground. It's for this reason that is necessary to couple thermography with another method to validate locally what was observed overall. The instrumentation installation allows to raise the datas of flow and temperature on the facing surface. We can thus study the energy interactions between a system and it microclimatic environment. The system response to the natural requests will depend on its nature. For experimental point of view, the used sensors are of fluxmetric type. Their design is based on the technology of printed circuits. This make it possible to have light sensors of low thickness (some tenth of mm) and of variable sizes and forms. Their particularly robustness intends them for in situ measurements, whatever the atmospheric conditions. Simultaneous measurement in the same plan of flow and the temperature is obtained by a plated thermocouple integrated into the sensor whose dimensions are: 25 cm x 25 cm x 0.03 cm. They are positioned on the surface of concrete facing by joining lubricate. The acquisition of data was carried out by an autonomous power station with a statement of data all 120s during several days. The positioning of sensors on slab was conditioned by thermographic statement. It was decided to instrument supposed healthy zones and supposed deteriorated zones. This will make it possible to compare, after data processing, experimental impedances obtained by measurements, with theoretical impedance of a medium defined as being healthy. The healthy medium will be regarded as being continuous since thermophysical characteristics of the concrete and of the ground are relatively close and the contact between two materials is assured. In this case the system will be supposed to be semi-infinite, with an effusivity b. It is admitted that any system drawing aside of this configuration will be regarded as being deteriorated. If one poses Z = e j2pfTe (with Te the step of time) then one brings back to the field of Fourier where one finds the experimental impedance system. According to the defined procedure, the first stage of experimentation consists to take facings thermal picture to obtain a cartography of the surface apparent temperatures. Figure 2 presents a picture of one part of a concrete facing and the corresponding thermographic representation. The thermographic statements were carried out in end of afternoon in covered weather. The apparent temperatures of surface reveal variations of about 2°C. Consider that we leave a period of a few days without precipitations, we can estimate that the concrete water content is relatively homogeneous, which cannot explain such surface variations. In the same way, the facing shows a rather regular quality surface, consolidating assumption made on material emissivity. One can thus estimate that the results observed are mainly due to sub-surface heterogeneities, caused either by the undermining presence or by different qualities of grounds or by irregularity of facing in under-face. In all the case it has a relationship with degradation. Possible variations of emissivity couldn't generate differences in so consequent temperatures. So the thermographic representations let suspect great degradations on all slabs. We will be limited in the continuation of work to a given representative zone. The next step consists in coupling the thermographic method with a contact method of fluxmetric type. The provision of sensors is conditioned by raised by surface cartographies. The principle is to lay out the sensors according to apparent temperatures observed, this process is represented figure 3. We chose to test the adjacent zones presenting the most consequent variations in temperature, in a range of values varying to 1°C until 2°C. Fig 2: Visible and thermal picture of facing. Fig 3: Sensors disposition. Connected to a power acquisition station autonomous, the sensors give the temperatures statements and the flows carried out over several days. Figures 4 and 5 present the type of data collected. Fig 4: Heat flow measurement. Fig 5: Temperature measurement. The curves reveal the preponderance of the component day/night. The richness of the excited frequencies and the duration of the raised signal will determine the depth of inspection. In our case of study, it is about 20 cm. From the recorded data, one carries out the calculation of the experimental impedances as specified in analysis of impedance. The aim is to calculate each impedance and to compare them with a theoretical impedance corresponding to a healthy medium, that one will consider as being semi-infinite. The curves obtained are represented figure 6. The beam called curves 1 represents the impedances calculated starting from the measurements taken on the zones with approximately 13°C (zone 1) on the thermogram. This we strongly draw aside from the beam called curves 2 which gathers the measurements taken on the other zones at lower temperatures (zones 2) and the semi-infinite model. Considered that the curves not sticking to the semi-infinite model reflect zones of alteration, one notes that corresponding to the zones of the highest temperatures which can explain by the presence of one cavity in under-face of facing. This assumption joined the one had been done at the beginning on the global behavior of the system. The various positioning of the curves confirm the presence of the discontinuities supposed by infra-red thermography. The next step of work will consist in a development of a model allowing the quantification of the detected defect. Fig 6: Theoretical and experimental impedances calculated. The thermographic methods and thermal impedance showed a great complementarity. For experimental point of view, they are particularly adapted to in situ measurement because of their use ordinary. The data processing is more consequent, but deepened, it will make it possible to quantify observed defects. The limits of the method lie in the depth of control. This one depends on the richness of the signal, in particular low frequency, which obliges to carry out tests of long duration under natural excitations. HAMRELIUS, T., Accurate temperature measurement in thermography, AGEMA infrared System AB Department, (Vol. 13), Issue 3-4, pp.341-351 (1997). DEGIOVANNI, A., Conduction dans un mur multicouche avec sources: extension de la notion de quadripôle. Int. J. Heat and Mass Transfer, (vol. 31), n°3, pp. 553-557, 1988. DELACRE, E., DEFER, D., ANTCZAK, E., DUTHOIT, B., Identification by thermal impedance. Application to wet materials, High Temperatures High Pressure, (vol. 33), pages 337-344, 2001. LECLERCQ, D., THERY, P., Apparatus for simultaneous temperature and heat flux measurements under transient conditions, Rev. Sci Instrum, n°54, (vol. 3), pp. 374-380, 1983. DEFER, D., ANTCZAK, E., DUTHOIT, B., The characterisation of thermophysical properties through thermal impedance under random solicitations taking sensor-induced disturbance into account, Measurement Science and Technology, (vol. 3-9), pp 496-504, 1998.